Saturn's icy moon Mimas is dwarfed by the planet's enormous rings. Because Mimas (near lower left) appears tiny by comparison, it might seem that the rings would be far more massive, but this is not the case. Scientists think the rings are no more than a few times as massive as Mimas, or perhaps just a fraction of Mimas' mass. Cassini is expected to determine the mass of Saturn's rings to within just a few hundredths of Mimas' mass as the mission winds down by tracking radio signals from the spacecraft as it flies close to the rings. The rings, which are made of small, icy particles spread over a vast area, are extremely thin – generally no thicker than the height of a house. Thus, despite their giant proportions, the rings contain a surprisingly small amount of material. Mimas is 246 miles (396 kilometers) wide. This view looks toward the sunlit side of the rings from about 6 degrees above the ring plane. The image was taken in red light with the Cassini spacecraft wide-angle camera on July 21, 2016. 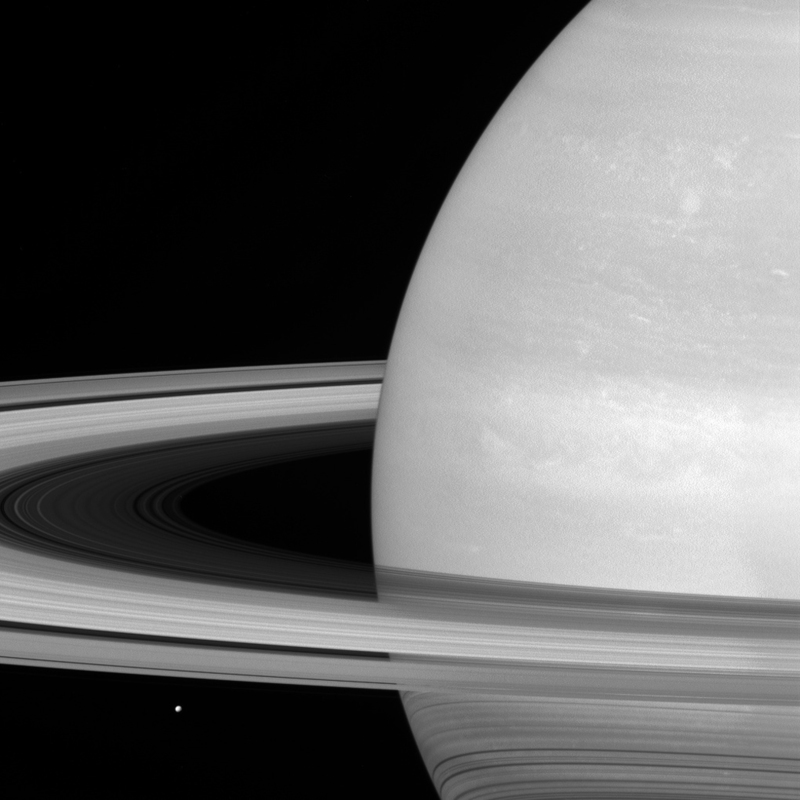 The view was obtained at a distance of approximately 564,000 miles (907,000 kilometers) from Saturn and at a Sun-Saturn-spacecraft, or phase, angle of 31 degrees. Image scale is 34 miles (54 kilometers) per pixel.